American children are starting their youth sports careers younger and playing harder. Often, as Dr. Wendy LeBolt points out, many kids play on multiple teams in the same season so they can continue to play the same sport all year round. Excessive training of over-scheduled kids can quickly lead to injury. LeBolt has demonstrated that, with proper balance and fitness training, young athletes can be better prepared and injuries minimized. LeBolt knows soccer and the science behind soccer and she emphasizes that young players need special care to develop their skills and bodies while they are still growing. Standing in the gap between health care professionals and coaches, she has designed training sessions which blend injury prevention and game fitness. Professional and parent-coaches will especially enjoy the video links provided as an interactive “take-to-the-field” training approach with age-appropriate games and drills. 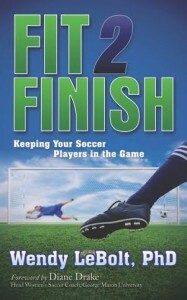 Fit 2 Finish is the perfect resource for any youth soccer coach. LeBolt not only understands the science behind the fitness training, but knows the way to work with kids. Her approach is practical, fun and easy to apply on the practice field. From games that provide age-appropriate target strengthening and agility, to proper stretching, nutrition guidelines, and injury assessment at the field, LeBolt covers everything the coach needs to keep kids playing, improving and reaping the benefits of healthy sport during this season and for years to come. If you would like more information about this topic or to schedule an interview with Dr. Wendy LeBolt, please call Rick Frishman, Morgan James Publishing, at 516.620.2525 Ext. 101. After advanced degrees in exercise physiology, 23 years of soccer parenting, 15 years of soccer coaching, and 10 years of teaching exercise and sport science at the college level, Dr. Wendy LeBolt knows how to train for soccer. In 2001, she founded Fit2Finish, LLC, where she has trained thousands of young athletes and their soccer teams in the Washington D.C., metropolitan area. In addition to her blogs, Fit2Finish.com and The Kinesthetic Christian, LeBolt also writes weekly for Soccerwire.com and has published hundreds of articles and columns about health, wellness, fitness and sports for various newsletters and magazines. LeBolt and her husband have three daughters and currently live in Oak Hill, Virginia. Fit2Finish: Keeping Your Soccer Players in the Game by Wendy LeBolt, PhD will be released by Morgan James Publishing on January 13, 2015. The book — ISBN 9781630472146– has 200 pages and is being sold as a trade paperback. Available for pre-order in December. Available now as an e-book.